This unique New England Train Tour showcases the region’s historic rail lines, historic trains, and the possibility of New England fall foliage. 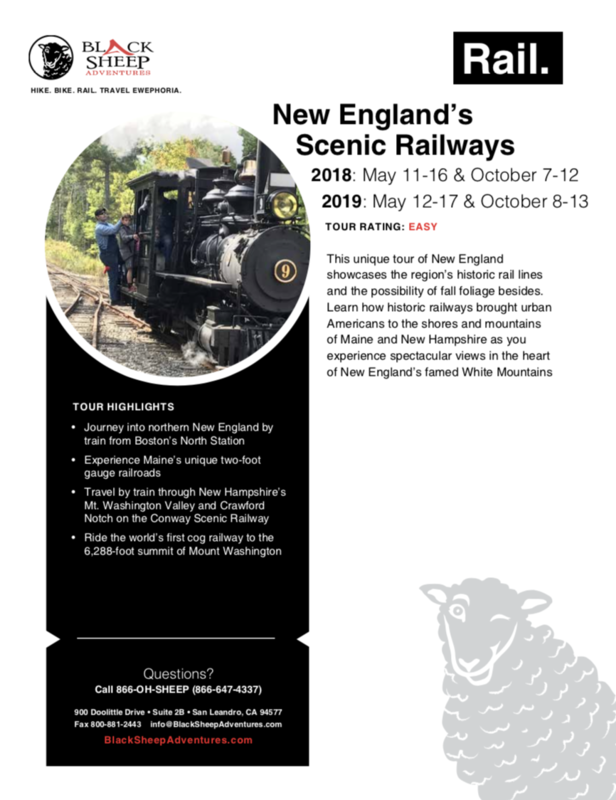 Learn how historic railways brought urban Americans to the shores and mountains of Maine and New Hampshire as you experience spectacular views in the heart of New England’s famed White Mountains. Experience America’s intercity passenger-rail renaissance aboard Amtrak’s Downeaster to Portland, Maine today. The train departs from Boston North Station, which from 1965 until 2001 served only commuters. Now, five daily Downeaster round-trips link twelve municipalities in three states. After our midday arrival in Portland we will take a short ride down to Scarborough, Maine home to the Winslow Homer Studio. We spend the afternoon exploring the studio on a private tour as well as a docent led tour of the Portland Museum of Art. In the evening we will visit the Portland Head Light before enjoying dinner with views of the Portland skyline. From the 1870s through the 1920s, multitudes of eastern city-dwellers summered in the White Mountains of New Hampshire and western Maine. They came by train and we will recreate a bit of their experience. A transfer from Portland by vehicle will take us to a midday train on a rail line they traveled. It became part of the Boston and Maine Railroad in 1890, and its passenger trains connected this valley with Boston until 1961. Freight service continued until 1972 and excursion trains began in 1974. We will enjoy lunch in the Chocorua dining car while passing Mount Chocorua, Mount Kearsarge and Mount Washington. Afterward we transfer to our hotel. Ride to the 6,288-foot summit of America’s most topographically prominent peak east of Colorado. After he got lost hiking and spent a freezing night on the mountain, New Hampshire native Sylvester Marsh conceived of a railroad to the top. Though his idea was ridiculed, the New Hampshire legislature gave Marsh a charter to build it in 1858. The Civil War intervened, and the Mount Washington Cog Railway was not completed until 1869. It was the first of its kind in the world and it stimulated hotel expansion and transportation improvements throughout New Hampshire, Maine and Vermont. Our train will employ a 19th Century steam locomotive built for the railway by Manchester Locomotive Works. After lunch along the shores of Lake Winnipesaukee we return to Boston for flights home. Set in a refurbished apartment building from the 1800s, this modern downtown hotel features classic rooms offer free WiFi and TVs with premium cable channels, plus desks and coffeemakers. The hotel’s ideal Back Bay location is just steps away from Boston's best shopping, restaurants, museums and attractions, like Fenway Park, Trinity Church, the Prudential Center and Newbury Street, as well as the Hynes Convention Center. The hotel is within walking distance of Portland's Old Port and the city's vibrant Arts District. Many of the guest rooms are enhanced with breathtaking views of the Atlantic Ocean on the bay side, the White Mountains and the beautiful Portland city skyline. There is a large indoor pool, fitness center and a full-service restaurant and lounge on site. This hotel is located on White Mountain Highway nestled at the base of the White Mountains and features a 5,000 sq. ft. indoor water park with two water slides and a wading pool. Relax at this North Conway hotel in a spacious guest room with modern amenities such as free WiFi, a 37-inch HDTV and a large work desk with ergonomic chair as well a 24-hour fitness center.